UPDATE: sadly the host for this pdf has changed & in the process the file was lost plus I'm not able to find my original file so I can't make it available again...so sorry...if I happen to find the file I'll update this post again with new info. The flat postcards should fit a A4 envelope, if you’re so inclined. Although they could also have a hole punched in a corner and be used naked. 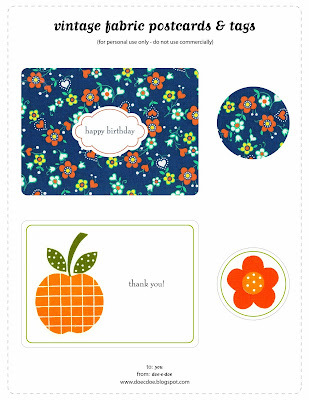 The round tags are so if you need a to/from tag as well as a card, you will have a matching set. Let me know what you think about the postcard format. I was going to do a folded card but then I got all stressed-out about it and flat just seemed easier all the way around. Last time, with the tags, I didn’t tell you that I use a heavyweight, matte paper to print stuff like this out on. I love the embellishments on The Constant Gatherer’s wreaths & this & this stuff she featured. She finds really cool stuff so I check out her blog often, so should you! Now lets see if I can get this right… I found this cool flickr group via this post by alilovescurtis which led me to this post by poppytalk. Isn’t the internet wonderful?! inspireco’s studio is so pretty! I want one of these décor-a-board birds BAD! AND – if you love Vogart embroidery transfer patterns then you will find this newly created database invaluable & you should send an email to floresita to thank her, because she is awesome! the cutest! I love them! Thanks! lots of fun links to check out! Thanks! Thanks for the PDF! What a great use for such sweet vintage fabric (?) patterns. Wow, lots of lovely links! Thank you! Thanks for letting me know you liked the links & pdf, I'm so glad! Sweetcheese, they are vintage, thrifted fabrics & since I don't sew, at least I can use them for something! I love these Vintage Cardss...thanks for sharing! Beautiful! I love the blue fabric! I'm a huge fan of the postcard format so I think these are great. Thanks os much, I'll be linking.